The first Class 717 carried passengers on the Great Northern network on September 28. The six-car dual-voltage Desiro City (717007), built by Siemens in Krefeld, Germany, ran from Moorgate to Gordon Hill. The remaining 24 sets will enter traffic in a phased introduction between now and next Spring. They provide 27% additional capacity compared with the Class 313s they will replace. The older EMUs date from 1976/77. The Class 717s are funded by Rock Rail Moorgate (a joint venture between Rock Rail Holdings and Aberdeen Standard Investments) in a £240 million deal. They feature air-conditioning, power sockets and WiFi. 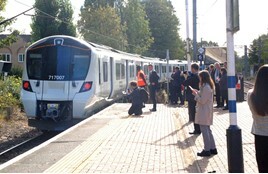 The trains will be used on the GN network from Moorgate to Stevenage, Hertford North and Welwyn Garden City. So in fact Great Northern have started using the Class 717. With more to be in service before the end of 2018. Well it’s time to say goodbye to the Class 313. Except Southern will keep their Class 313 units. And possibly could inherit few more cascaded from Great Northern. Except Southern won't get rid of the Class 313 which is currently operated on the East Coastway and West Coastway routes.